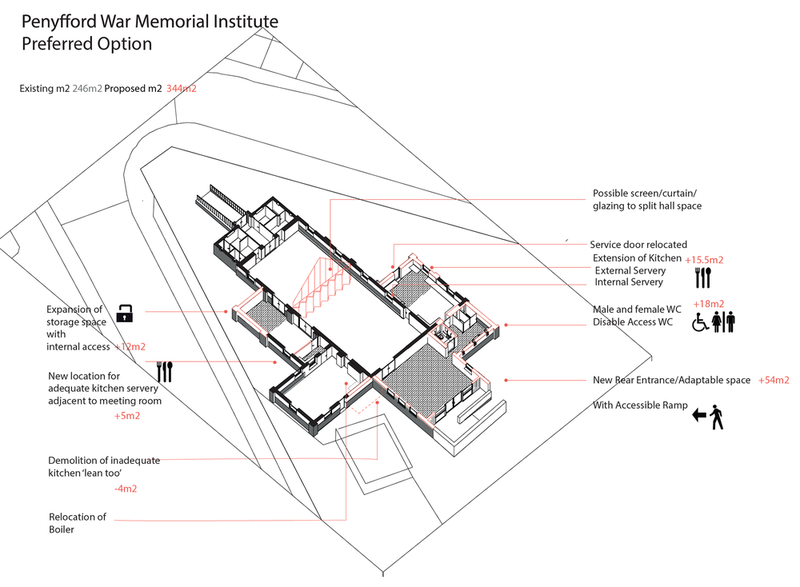 The Penyffordd / Penymynydd War Memorial Institute Committee have been working with architects, the Community Council and users of the building, to prepare plans for the extension and modernisation of the building. The plan is to create a new entrance from the car park which will provide additional multi-use space - a reception area, backstage area, stand alone room - or indeed someone to park prams. Within the extension will be new toilets including disabled access and baby changing facility. The existing front entrance will be retained. The proposal is to demolish the existing kitchen extension and replace it with a slightly larger one, including a serving hatch for outside events. Other improvements will include the removal of the existing stage and replacement with a removable stage, to increase the size of the hall and the potential to divide the hall into two halves. The storage area will be increased with access from the difference spaces to reduce disturbance. The existing small kitchen off the committee room would be relocated and a new boiler fitted. Overall, the intention is to modernise the building and increase the amount of useable space as well as the usability of the spaces. Right now the priority is to consult with the community - this building belongs to the village and is well used by groups and individuals in the village. What do you think of the proposals? Please use the form on this page to provide your feedback. Once the consultation is complete and any changes made to the plans, a planning application will be submitted and hopefully approved. The funding is in place and all being well we could be enjoying this new look community facility this year. By completed this form you give permission for your comments to be used in the planning application for the project. Your details will not be stored or used for any other purpose. I agree for my comments to be used in the planning application process.